Humans depend on microbes for survival. So do most animals and such symbioses can persist for millions of years. Scientists have discovered that certain wasps tightly control mother-to-offspring transmission of their bacterial symbionts. This stabilizes the symbiotic alliance and contributed to its persistence over the past 68-110 million years. Symbiotic associations are ubiquitous in nature and play a pivotal role for the ecology and evolution of most organisms on earth. This is exemplified by mykorrhizal fungi that are important nutritional partners for up to 90% of all land plants. Many symbioses have persisted for hundreds of millions of years, with a certain host species consistently associating with a specific symbiont. But how do these alliances persist? After all, many symbionts spend part of their life cycle outside of the host's body. 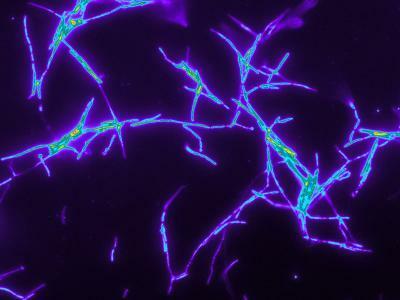 In order to prevent the acquisition of ever-present environmental microbes, the host must discriminate between friends and foes. A particularly fascinating defensive alliance occurs in the European beewolf (Philanthus triangulum), a digger wasp that hunts honeybees and provisions them for its offspring in underground nests. Previous research has shown that bacterial symbionts of the genus Streptomyces live in the wasp's antennae and on the larval cocoons. The bacteria produce a cocktail of nine different antibiotics that fend off detrimental fungi and bacteria from infecting the developing larva in the cocoon. This strategy to avoid infections is comparable to the combination prophylaxis used in human medicine. The scientists now reconstructed the phylogenies of different beewolf species and their symbionts. An analysis of the beewolf phylogeny revealed that the symbiosis with Streptomyces first originated in the late Cretaceous, between 68 and 110 million years ago. At present, about 170 species of wasps live in symbiosis with the protective bacteria. The comparison of host and symbionts phylogenies yielded another surprising finding: The symbionts of all beewolf species are very closely related, but their phylogeny does not exactly reflect that of their hosts, although this would be expected in case of perfect transmission of symbionts from mother to its progeny. "This pattern indicates that while beewolves occasionally replace their bacteria, they always do so with the symbiont of another beewolf species" explains Martin Kaltenpoth. "Although free-living relatives of the symbiotic bacteria are very common in beewolf habitats, they are apparently not able to stably infect beewolves and replace the native symbionts." To determine how beewolves maintain the association with their specific symbionts, the scientists generated symbiont-free beewolves and then infected them either with their native symbionts or with a related bacterium from the environment. 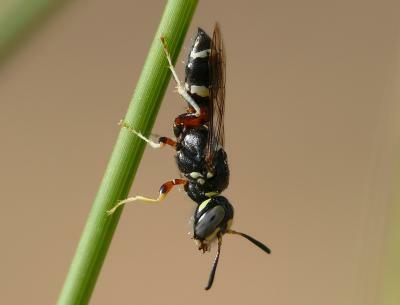 Although both microbes grew in the wasps' antennae, only the native symbiont was successfully transferred to the offspring. "Preventing transmission of other – possibly detrimental – microbes might be important to avoid infection of the cocoon. At the same time, beewolves ensure that their offspring inherit the true defensive symbiont", concludes Erhard Strohm. The beewolves' strategy to transmit the appropriate symbionts provides a unique glimpse into how a symbiosis can remain stable over millions of years, and it helps explain the abundance and persistence of symbiotic associations in insects. In the future, the scientists hope to uncover the molecular basis of how beewolves manage to selectively prevent transmission of non-native bacteria.